So you created your first blog and you wrote some amazing articles. You feel proud of your content, and you know it’s worth reading. But no one is visiting, nor commenting your posts. Also, you’ve just started your journey online, you don’t have strong connections. You landed in the right place, then! I have the solution for you. In this post I am going to introduce you MyBlogU, a new amazing place to collaborate in order to create epic content, be promoted over the internet and build new connections. After you complete the registration process and you have chosen your username, be sure to set up your profile. You want to add your social media profiles, like Twitter, Facebook, Google+, Pinterest and StumbleUpon. Also, be sure to write your sites and the proper tags. 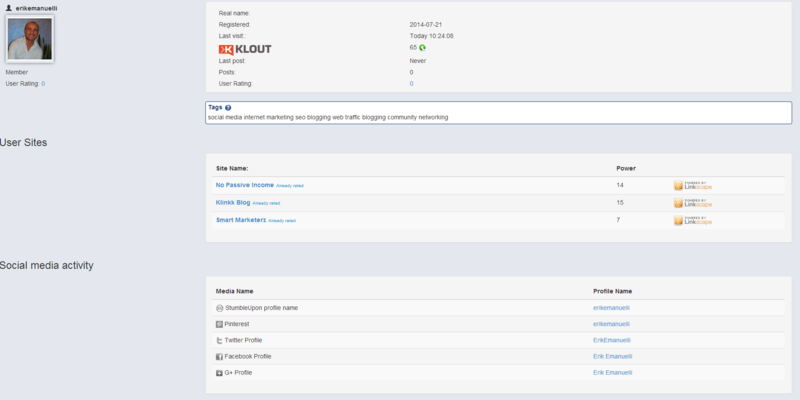 Your Klout score will be added automatically. Now you can browse within the site the three main sections, which are “Brainstorms”, “Interviews”, and “Media”. 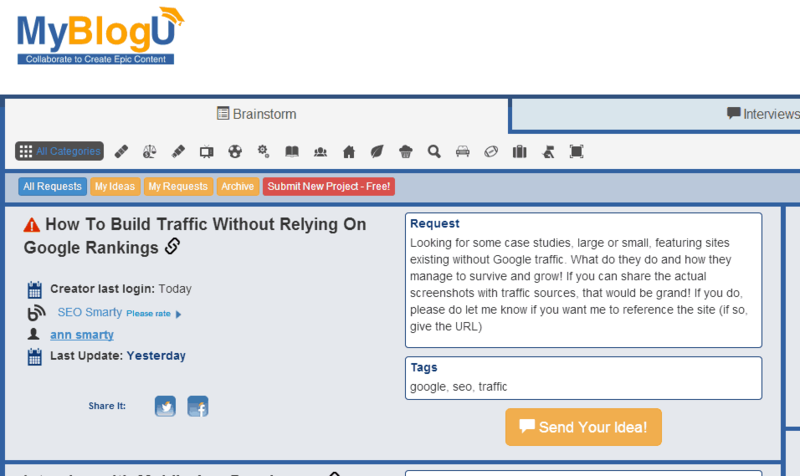 Brainstorm is the part of MyBlogU where you can put into your projects in order to request the community help. 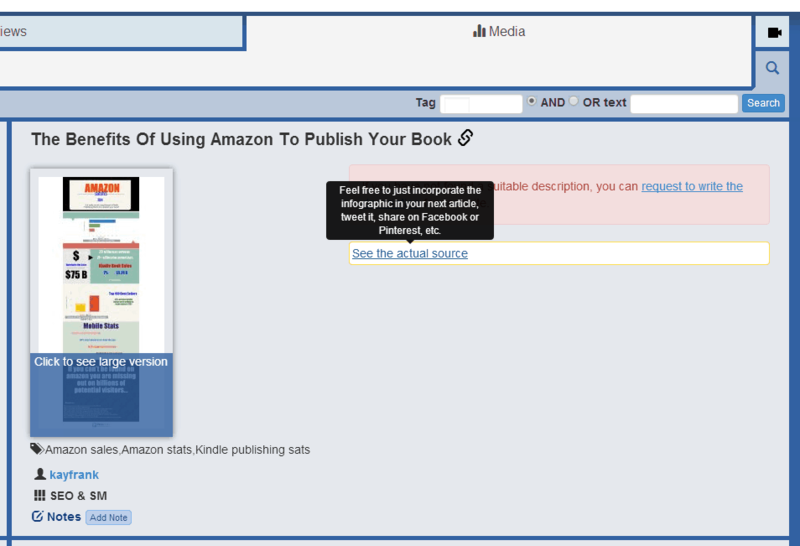 You need to add title, subject, tags, text of the request and deadline within users can participate with their support. Also, be sure to select the proper category for your project, browsing among the several ones available. Media is the section where users can add their visual assets, basically infographics. You can choose the media, which suits best the topic of your post and incorporate it in your blog. The Interviews section is the core of MyBlogU site. You want to browse among the several interviews from other users, answer the questions, sharing your knowledge and receiving a credit when published on their site! This is a fantastic way to be promoted among the blogosphere and build new connections with the blog which host the interview. I want to show the core feature of MyBlogU in action in this blog post. And these are the answers to my question (it was just one, but you can add as many questions as you want in your interview). What are, in your opinion, the benefits of joining and be active on MyBlogU? MyBlogU is a powerful tool for the writer. The platform allows me to gather interviews and ideas from others. It is an online networking hub. Rather than taking time to identify experts on a certain topic, then approaching those experts for an interview or advice … MyBlogU allows me to post my questions and collect a wealth of responses. MyBlogU saves time and money. Moreover, it allows me to build my own brand by responding to requests from others. MyBlogU is like an online cafe where creative people hang out and help one another succeed. If you are active on MBU you will make contacts and friends amongst the other active and helpful users. This alone is a good enough reason to be active because we all need friends online. Talk to people on the weekly Twitter chats.. However there are other reasons, too. The Interview feature is equally awesome, allowing you to gather thoughts from people who are working in the niche. Automatic social media promotion using Viral Content Buzz of your brainstorm and interview sourced blog posts. MyBlogU.com is a superb example of how “paying it forward” works. You help others when you can and they help you when/if you need it. It is another example of the 6 degrees of separation working. If you want a contact in SEO in California and you are in Spain then MBU is a great way to find the person you need. If you want to trial an idea on a small scale you can use the forums to sound people out. MBU is a new concept and will help you to gain traffic regardless of the ranking algorithms of certain search engines. Joining and being active on MyBlogU has not only introduced me to other relevant industry bloggers, but has also allowed me the opportunity to provide my insight and answers for the group interviews that are conducted on the platform. If my feedback is insightful to the questions being asked, I can expect to be mentioned and credited with a backlink in the blog article they produce. More importantly, I believe the biggest benefit to me personally is engaging and building a friendship with Ann Smarty, who runs the show. Ann is very well connected in the digital marketing world and has been featured across numerous top industry blogs. By supporting her projects like, Viral Content Buzz, and applying to become a MyBlogU brand ambassador, Ann has already made it clear that she loves returning the favor which I can then utilize later as either an introduction or reference for bigger opportunities. While I have been using MyBlogU for a little over a week I’ve come to love the place. Even though the community is small there are so many ideas flying around that it makes a great place to find some inspiration. I love the idea of giving my insight into topics and then having them published in other peoples blog posts and (hopefully) gaining a backlink in the process. Not only does it allow me to broaden my audience, but also build my authority. I actually wrote my own review here. I think it is a wonderful opportunity to learn from others and network – meet others with a common interest. Sharing ideas and getting feedback and help can be priceless for so many people who may not know where to “go”. I think this community would benefit all, but in particular those who are new to blogging, to learn from those more experienced. There is a forum, where users can interact and know each other, giving support and sharing knowledge. Another great feature is the Twitter Chat, which can be set up via your Interview project. I find this option a great way to promote you and your blog. Once you publish the interview on your blog (like I did just above in this post), an email notification will be sent from MyBlogU to the users participant in order to invite them to participate and share your content. Also, the published interview will be feed to ViralContentBee, a great site you should already know about and you can use to get your articles shared via social media by the platform users. MyBlogU is, at the moment of this writing, in beta version. Be sure to jump on the bandwagon and participate in this awesome project since the very beginning. I see a huge potential with this site. I strongly suggest you to take a look right now. You can visit their blog to know even more. Have you already heard of MyBlogU? Glad you enjoyed the news, Louie. Good to see you here, Enstine. Happy to know you will take part of this new project. Really a good platform to promote your content. You should try it, Kuldeep! Well I’m also new to myblogu and I guess its really wonderful platform for blogger and I’ll check it out right after I comment here. Nice features so far I guess. Already signed up in morning and I’d dig up into it soon. Glad this post showed you something new, Satyakam. Myblogu looks promising. Many blogging communities are coming these days and we bloggers are finding it difficult to promote our blog on each of them. What say? 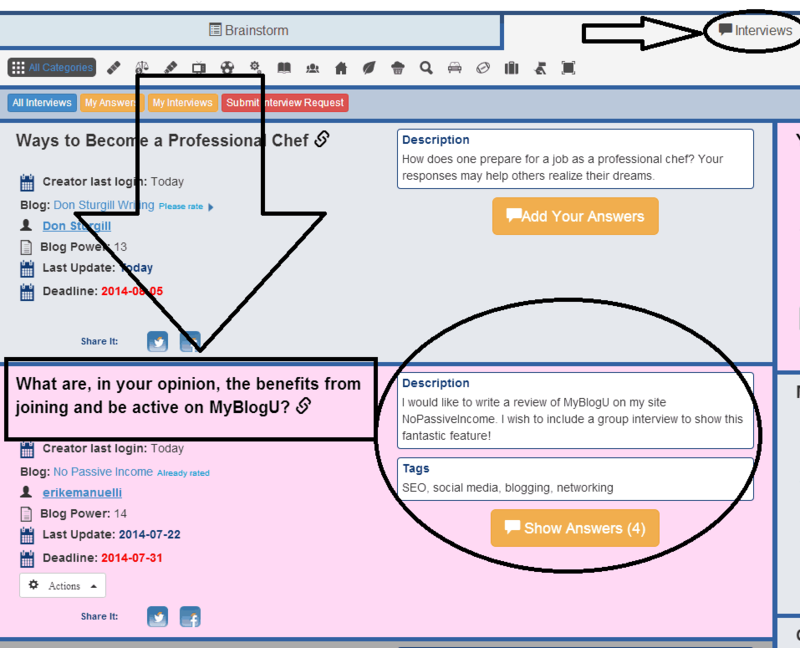 If you take a look to MyBlogU is actually completely different than a blogging community. Just found this post from BlogEngage and great post. You’ve introduced me to something new, I did not know of yet. Will surely have to try MyBlogU out. As read from the article, it’s great platform for promotion. Glad to know you learned something new here, Mainak. Thank you so much for this post sir. I am so much impressed with this tool. Will head for signing up. The features of this website are really superb. I will surely leverage the power of MyBlogU. I heard about this and Viral Content Buzz, but not tried yet. Thank you so much sir. I will visit again after getting some positive result. MyBlogU requires some efforts, but it is indeed worth the time invested!